From Bleeding Cool website:"Bryan Q Miller, also recently of Batgirl until the DC Relaunch, is to write a new novel, telling the story of what happened to the Smallville cast after the end of the TV series, in continuity. The bolding is mine. What happened to the cast? So rather than continuing Clark's story, the book will recount the thrilling saga of the cast going on auditions and Tom's trip to Germany to buy a horse? I'd totally read it! Speaking of post-SV projects, Michael's old high school has posted an interview with him in their newspaper! Much discussion of his upcoming made-in-Indiana film. Interview's on page 3. 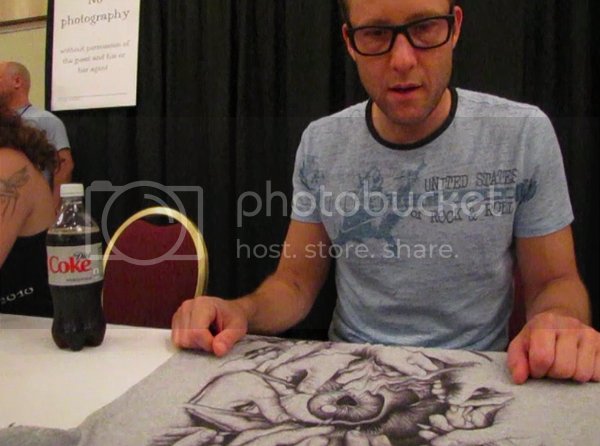 An artist posted this Michael-pic yesterday - he designs shirts & gives them to his fave celebs at Cons. His artwork looks great but I'm equally impressed by the way Michael's own t-shirt is hugging him! There's a new tumblr devoted to BTS Smallville. I'd never seen this shot of Michael & Justin before. 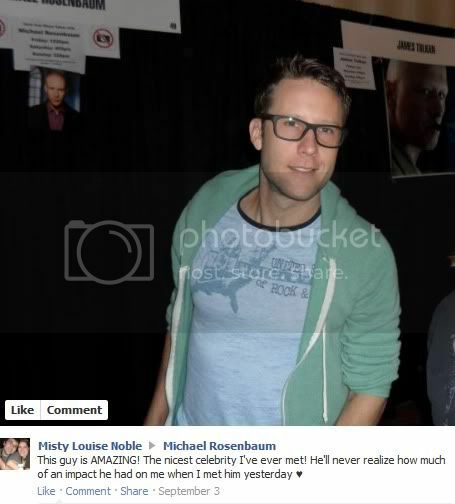 This fan posted a photo on MR's facebook wall - great angle for chest ogling! Tom's trip to Germany to buy a horse? LOL. Did he really do that? But tbh, i am a bit curious if we will ever see him in a show again. He did buy a horse from Germany! But no sightings, alas. i am a bit curious if we will ever see him in a show again. That is a beautiful horse! And a lot of money for him. It would be a bit sad but i totally understand it. He has never really been one of those celebs who want to be in the spotlights. Yes, Tom doesn't care about being famous at all! Which is kinda sweet. I adore the glasses. Such a charmer! omg, real life fiction, I'd totally read it, hahahah. Admittedly, that'd be funny. I would absolutely read it as well! Huh. A "in-canon" fic after Season 10? This both delights and scares me. (Particularly if they/DC starts treating SV!Lex like DCU!Lex -- or worse, DCnU!Lex...) And do they really mean post-series, past the 7 years later, with flashbacks? Yeah, if someone's going to do it I'm glad it's BQM. I thought he was the best of the post-S8 writers. It will be interesting if he picks up the story in 2011 or jumps ahead to 2017, as the final scene of the finale did. Always love a pic of Michael in a tight T-shirt! Nice interview with his high school newspaper. I've seen several people tweeting him begging to be involved in the film, heh! I'd be much more interested in a book about the continuing adventures of Michael and Tom too! I haven't seen that BTS picture before either. Michael looks a bit like he's about to do a Dutch-style "Face!" on Justin, heh. Particularly if there are lots of hot tub scenes! He really does! Perhaps "Face!" is something he practiced on Tom & Justin long before Dutch. Bless his heart, I hope this doesn't lead to wankiness. Small towns have their own way of going about things. It's so sweet he wanted to film there instead of in LA.